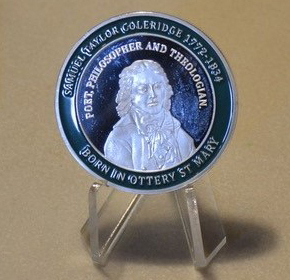 The Ottery St Mary Coleridge Memorial Trust and its patrons have produced a beautiful commemorative coin to mark the beginnings of a fundraising effort for the planned sculpture of Samuel Taylor Coleridge in the parish churchyard. The coin is 50mm (2 inches) in diameter and finely worked with a portrait of Coleridge in silver and aquamarine on one face and the Ancient Mariner’s ship on the other. 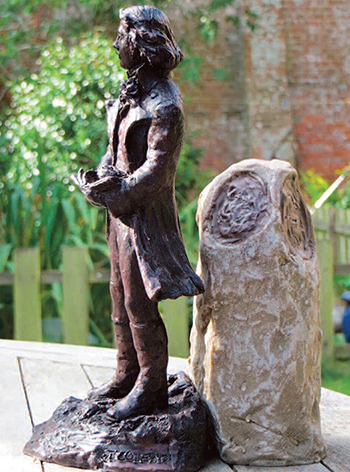 Just 250 copies have been struck in recognition of the 250th anniversary of Coleridge’s birthday in 2022. It is the CMT’s hope that the funding will be complete and the sculpture in place by the time the anniversary celebrations take place. The coin comes in a protective, snap-shut plastic cover contained in a royal blue presentation case. If you’ve been looking for a timeless Ottery St Mary keepsake, or simply a unique item, this is highly collectible. We anticipate that the entire project will cost in the region of £100,000. 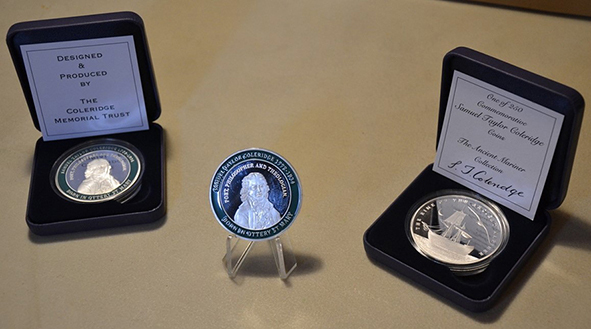 The limited edition of Coleridge Commemorative Medals is a vital part of our fundraising campaign.